Signature Theatre is a Tony Award®-winning, non-profit professional theater company with a mission to produce contemporary musicals and plays, reinvent classic musicals, develop new work, and reach its community through engaging educational and outreach opportunities. Signature Theatre was founded in 1990 and has staged 25 world premiere productions. This season Signature will be staging SHOW BOAT, the classic musical by Jerome Kern and Oscar Hammerstein II based on the novel “Show Boat” by Edna Ferber. Congratulations on Signature Theatre’s 2009 Regional Theatre Tony Award®! Has winning the Tony affected your theatre? It’s been wonderful for the theatre and the Washington theatre community. Washington has always been a great theatre town and I think this recognition just highlights the great work being done here. It’s also made even more people want to come to Signature and see the work we are doing. Signature attracts more than 80,000 patrons annually, including more than 5,000 subscribers. What is it about the theatre that keeps them coming back? I think it’s the sense of adventure. Audiences never really know what they are going to get when they see a Signature show. Because both theaters are flexible spaces, each experience is unique. I also think that the intimacy is a huge factor in having the Signature experience. You’re not just seeing a show, you’re living in it. Why did you choose SHOW BOAT for the Signature Theatre? For the 100th production of the theatre, I wanted to do something different. I also wanted to produce something that audiences would never think of us doing. I have always loved SHOW BOAT and the idea of bringing that show to life in an intimate setting and putting the story at the forefront really intrigued me. I also really felt it was something that was ripe to be re-imagined for the new century. SHOW BOAT is considered epic theatre – it spans decades and it has a large ensemble cast. How have you re-imagined SHOW BOAT for your intimate 276-seat theatre? The biggest challenge to mounting SHOW BOAT was how where we going to tell the story that made it fresh and unique. The first thing for me was in the design of the show and knowing that we would be doing this production with no boat. In fact, that is our staff pet name for the show- NO BOAT. We wanted to focus on the characters and their relationships in this sprawling epic tale. The design is very cinematic and while it is representational- it also makes the audience do some of the work in painting the rest of the scenic pictures. We use title projections for the passage of time and other than that it’s the actors living the story that propels us through time. How did you go about piecing together this version of the musical? We looked at three different versions of the show for this production, 1927, 1946 and the 2005 Stadttheater Bern. Using the 1946 version as our basis, we then looked at the entire arc of the story and went back to the original 1927 scene order of act two. I think we mined all the great material for the show and I’m really pleased with the end result. In the press release, you mention that SHOW BOAT “will feel like it was written yesterday.” Can you elaborate? The wonderful thing about this show is that it feels timeless. I think the current day climate of our country makes you realize many of the issues that were focused on in the musical are still with us today. We’ve had entirely new orchestrations done for the production by Jonathan Tunick which will be a whole new sound to the show. We also don’t shy away from any of the issues. At the top of the show, the audience sees workers picking cotton with just the sound of a river flowing in the background. They will realize that this is not your average production of SHOW BOAT. That river plays an important role in this production with the endless horizon. The river will change every character’s life forever by the end of the evening. The design makes the show feel very modern and epic but emotionally connected to the audience. Even our new logo for the show represents something that is faded in time. I didn't want it to be a big old pageant but to represent the struggle for survival and change over time. Our logo captures exactly the feel of this entire production. It’s hard to pick out one. There are so many great moments that you discover when the show is deconstructed like our production. I think the experience of SHOW BOAT becomes a much deeper and richer experience for an audience. So that would have to be my favorite moment - the entire experience of this production. Hopefully this production will encourage other theatres in the country to produce this version with the new orchestrations. It’s a show that deserves many more people to be seeing it. In addition to the “granddaddy of musical theatre”, as you call it, SHOW BOAT will be joined by a very new and original musical, [title of show] in March 2010. How do you see these two shows “fit” into Signature’s season? That’s really what makes Signature signature. The wonderful thing is that we give our audiences so many unique theatre experiences all under one roof. 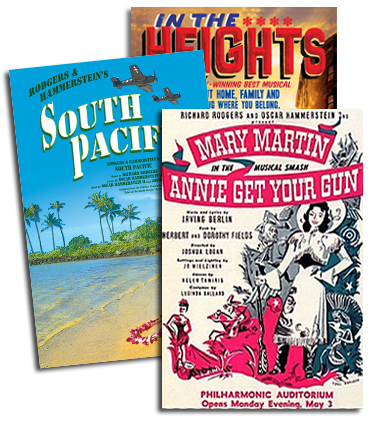 I love that we’re producing both of these shows – one being the great musical that began it all and the other being a brand new musical form an exciting set of new writers. It’s great that we can do these kinds of productions all under one roof.